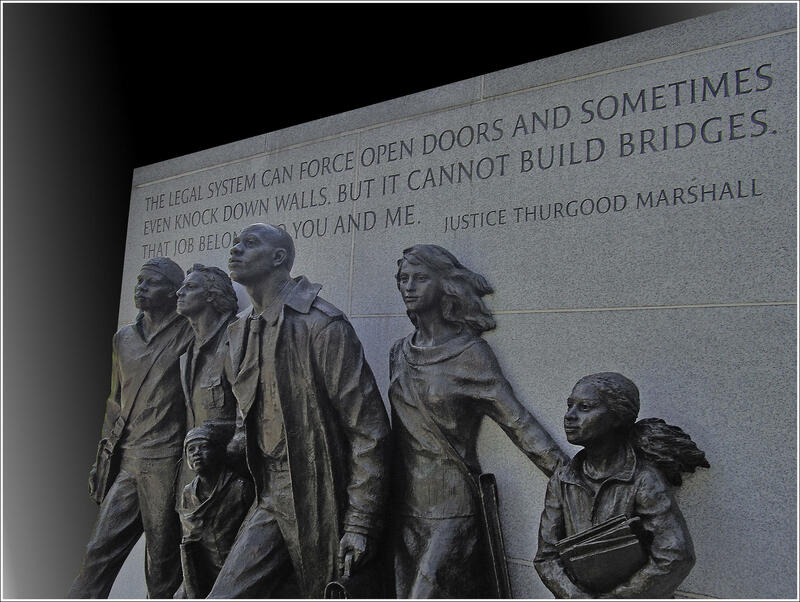 The Virginia Civil Rights Memorial at the state capitol commemorates the battle to desegregate schools in the state. This fall, for the first time, more students of color walked into public schools for first grade than white students. But even as this country gets more diverse, many school systems still remain segregated. To help understand why, and what can be done, a professor at Virginia Commonwealth University compared approaches to integration taken by four different southern cities. The least successful was right here in Virginia. Genevieve Siegel-Hawley pulls up a series of maps on her computer. The first is of Richmond City and its suburbs. You can see how neighborhoods break up by race, and on top of that are small pie charts, some mostly red, some mostly green. That makes sense. Where the neighborhoods are primarily white, the school’s population is primarily white -- and vice versa. But it also means the map is filled with stark contrast. In Richmond the pie charts are all green. In the surrounding counties, they’re completely red. This map isn’t from the 1950s or 1960s. It’s from 1990. Siegel-Hawley pulls up the 2010 version, and it’s not much different. “The segregated minority schools in Richmond stay virtually the same, but the big difference is that there’s some growing diversity in the suburbs,” Siegel-Hawley says. Desegregation in the South hasn’t always had a lasting impact. Research shows many public schools are more segregated now than ever before -- including here in Virginia. You can see that in these maps. Many of the area’s schools are predominantly white or black, very few have significant percentages of both races together. 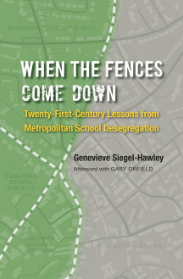 But Siegel-Hawley doesn’t despair, her research also involves other southern cities, some showing a successful way to integrate schools. The key, she says, is regional cooperation. Jefferson is a county surrounding the city Louisville, Kentucky. But instead of having two separate school systems -- think inner city vs. suburb -- they both fall under one very large district. “Today they’re under a controlled-choice plan, which means everybody makes a choice,” says Siegel-Hawley. She says Louisville’s regional plan, with controlled choice, has largely been successful and embraced by the community. Siegel-Hawley's new book, available now. They assign kids based on location, where their siblings might be, and whether it will create more diverse schools. Siegel-Hawley says the community there has chosen to prioritize diversity. A middle school outside Richmond is seeking suggestions for a new name. The change comes after almost a year long fight to get rid of the old one. The school is Byrd Middle in Henrico County. Jordan Chapman first learned who Harry Byrd was from her high school history teacher. “When we were talking about segregation and the civil rights movement, he said ‘Hey, did you know there’s a school right down the street that’s named after a segregationist. ',” said Chapman. Virginia's fifth largest school district is considering a big change -- pushing up its start time for high schools by more than 2 hours, from 7:20 a.m. to 9:30 a.m.
Virginia colleges have made strides in raising graduation rates for black and latino students, with VCU leading the way. That's according to a report from the Education Trust. The study collected data on every public school in the country. It looked at each college's graduation rates today, and 10 years ago, comparing the rates for minority students to their white peers.